It is only fair that from the start I confess my ambivalence about Richard Strauss’s music. About the level of inspiration, the impeccable craftsmanship, the brilliant technique, there’s no question at all; whatever I might say objectively about it, his music is for me entirely a matter of taste. I respect most of Strauss’s work; I admire much of it; I love some of it without reservation. I regard some works, such as Till Eulenspiegel and the Metamorphosen, as among the best that a century of our art has to offer, and it shouldn’t matter to anyone that others, such as Ein Heldenleben, Don Quixote, Zarathustra, the Domestica and Alpine symphonies and nearly all of the operas after Rosenkavalier, leave me cold, irrespective of their mastery. And I am really only beginning to appreciate Rosenkavalier, slowly and painfully. That said, I love many things in Salome and Elektra even though I have to brave their excessive longueurs, their musical violence, and their simultaneous incongruities of industrial-strength sentimental styles that verge on vulgarity. And it is hard to separate these two remarkably original works from a century of subsequent operatic evolution, especially through the glass darkly of Wozzeck and Lulu, which both Salome and Elektra influenced. Elektra got a performance in New York in French (!) in 1910, but not until 1931 did America hear it in German, and I am unaware that any such reaction occurred then that had caused Salome to be banned as obscene after its first American production in 1907. Salome is partly about necrophilia and vampirism, not to mention filial disobedience, but Elektra, like Sophocles’s play, is about Electra’s maddened desire to avenge the axe murder of her father, Agamemnon, by her mother, Clytemnestra, and Clytemnestra’s paramour Aegisthus. Because of this mania, Hofmannsthal and Strauss keep the title character on stage during almost the entire duration of the opera. Electra wants her sister Chrysothemis to participate in a dual execution of Clytemnesta and Aegisthus; when Chrysothemis refuses, Electra curses her and enlists her banished brother, Orestes, to consummate the deed, which he does, but without the axe. Elektra was, in 1909, Strauss’s bravest advance toward the abyss of atonality, into which he peered for a while before retreating into safety. (That same year, to name just a couple of contemporaneities, Sergei Rachmaninoff, a 19th-century Romantic descendant of Chopin, wrote his Third Piano Concerto, while Arnold Schoenberg, a year younger than Rachmaninoff and ten years younger than Strauss, in his Five Pieces for orchestra, op. 16, looked into the atonal abyss and jumped in joyfully with both feet.) For Elektra, Strauss determined that the radical Angst that pervades the entire Hofmannsthal play demanded a chromatic harmony that he could control with an elaborately contrapuntal texture. Some of this appears in characteristic leitmotives, such as the D-flat-7th over E in the bass, which appears as early as the third page of the full score. (Most of the important leitmotives of the opera are stated within the first five minutes.) The chromatic harmony is always very clear and never gratuitous, no matter how complex. But the diatonic harmony, much of it associated with Chrysothemis’s appearances on stage, always makes an uncomfortable psychological contrast, especially because so much of it is cast in waltz rhythms that look forward to Rosenkavalier, and we absolutely don’t want to feel that the Trojan War and its aftermath took place in Vienna. But Strauss obviously knew this and built on it. The orchestra of Elektra is memorably huge. If Strauss’s specifications are followed strictly, the complement is about 110 players; various reference sources, by adding doubling strings, increase this number to 120, which is still less than the 140 or so usually demanded by Schoenberg’s Gurrelieder. Strauss is supposed to have said to at least one orchestra: “Please play very very softly, because it’s all composed so loud.” (Other wags have Strauss saying, “Louder! I can still hear the singers!”) When one studies the score in performance, one is moved to wonder how much of the amplified orchestra is really necessary—one hardly ever hears the heckelphone or the basset horns, for instance, and the bass trumpet and contrabass trombone could easily be substituted by others. But the sound of the Wagner tubas is wonderful, especially in the Orestes motive (“Hier muß ich warten.”) Only in a few places is the full orchestra deployed at full volume for any length of time—when Clytemnestra enters with her sacrificial animals, when the news of Orestes’s rumored death arrives, in Electra’s culminating dance (an adumbration of Stravinsky’s “Sacrificial Dance” four years later), and a few other instances. Otherwise the loudest passages are mostly accentual, as in the opening measures with the “Agamemnon” motive (which also end the opera two hours later). I go far out on a limb for saying this, but I believe that in Elektra, more than in either Salome or Rosenkavalier, the overall orchestral texture is well-proportioned despite the excess of instruments; the elaborate counterpoint of the inner parts is mobilized in support of the harmony, in which there is a lot of parallel writing (compare Debussy, who probably would have hated it) and chromatic creeping that obviously interested Strauss for its sheer sound. The texture is often complex, but the leitmotives and the harmony are always explicit—and the singers doubtless were grateful for this. So what do my serious reservations about Salome and Elektra ultimately boil down to? Above all, it is Strauss’s chopped-up method of operatic composition, which is slavishly tied to the leitmotive principle in ways that essentially impede natural musical development. Every moment hangs on the text, and upon the back-and-forth dialogue, and one gets the impression that any dramatic structure in the music itself is mostly unplanned; it is as though Strauss were composing at top speed from one day to the next without knowing where he was or where he had been, driven only by the progress from moment to moment of the libretto, with his handy little Leitmotivtabelle at his side. Instance in point: when Electra, alone on stage in Scene II, is addressing her dead father Agamemnon, at “…the hour, where they struck you down—your wife, and that one who slept with her in your royal bed…” (No. 39). The chromatic chordal accompaniment in divided strings would in itself be a good psychological support for this creepy reflection, but Strauss, with perfect incongruity, chooses this delicate moment to add the bouncy leitmotive of Aegisthus—in a solo tuba. Elektra was Strauss’s first collaboration with Hugo von Hofmannsthal; five more were to follow, and Rosenkavalier, coming in 1911 right after Elektra, is considered one of the most successful and beloved operas of all time. But a subsequent century of mankind’s troubled existence on earth makes me realize why Elektra is dramatically unsatisfactory. Hofmannsthal’s Electra is too furious, too much a creature of insanity, to legitimately demand that someone else be the instrument of her vengeance. In our own time, she would have to wield the axe with her own hands; no lesser personal action would suffice. But what makes all the dramatic crudities in Elektra of merely passing irritation are those many extended moments of amazing technical brilliance and spectacular sound that are well worth waiting for: the dread approach of Clytemnestra and the tortured narrative of her dreams; the volcanic eruption of orchestral tutti just before the news of Orestes’ presumed death (No. 1a); Electra’s curse of her sister Chrysothemis (No. 109a) and the digging music that follows immediately; and the vengeance scene, where Electra paces around “like a caged animal,” waiting for Clytemnestra’s death shriek. In preparation for writing this report I took the trouble to listen to three different recordings of Elektra for comparison, plus one of Salome for background. (I didn’t hear the BSO’s concert performance of a year ago of Salome that Andris Nelsons directed.) But Elektra live in Symphony Hall is like a totally different world, a well-nigh overwhelming experience of sound. The performance included several cuts that were sanctioned by Strauss, doubtless to help Electra and Chrysothemis, who have two of the most difficult vocal roles any operatic singers have been called upon to fill. The performance was semi-staged, the characters moving on and off stage as the scenes demand, and providing as much gesture and action as the small space allowed – but this was entirely adequate dramatically. (For the final scene there was a chorus up in the second-balcony aisles.) Christine Goerke, as Electra, never faltered for even an instant in what is universally recognized as one of the most demanding soprano roles ever composed; she radiated power throughout, communicating an uncanny intensity in every phrase and every gesture. Gun-Brit Barkmin, singing the hardly less ferocious role of Chrysothemis, was every bit as convincing, and the richness of her voice resounded even in the last notes of the opera (“Orest! Orest!”). Jane Henschel, as the aged and fevered Clytemnestra, recounted her nightmares and premonitions in a voice that was totally penetrating and shuddering. All three of these fine singers are already known to BSO audiences. The tenor Gerhard Siegel, another BSO veteran, did wonderfully in the lesser role of Aegisthus, who is like Baron Ochs or Beckmesser writ small. The part of the young Orestes was sung by the British baritone James Rutherford, here in his BSO debut; his sound was clear but somewhat lacking in intensity for the role, which includes a good deal of rich basso, more, perhaps, than Strauss had originally planned. Ten other singers represented the retinue of the house of Agamemnon, and all of them were as excellent as they were effective. All of this huge performance was led by Andris Nelsons, who mobilized and organized it with an excellent precision which kept everything under complete control. I never had even an instant of difficulty following his beat, which even in the largest gestures was crystal-clear, as is certainly necessary considering the size of the orchestra. The tempi and meters are constantly changing, like the moods of the drama, and these changes demand the utmost of the conductor’s concentration. Nelsons’s task was heroic and he met it completely. Congratulations to him, and to all of those whom he brought together so successfully. It will take me a while longer to appreciate Rosenkavalier, but last night’s performance convinced me even more that Elektra is a great work. “Electra wants her sister Chrysothemis to participate in a dual execution of Clytemnesta and Aegisthus; when Chrysothemis refuses, Electra curses her and enlists her banished brother, Orestes, to consummate the deed, which he does, but without the axe.” That is not an accurate summary. Elektra is expecting Orest to come to do the killing. When she hears that he is dead, she tries to get Chrysothemis to agree to help her do the deed. Than, it so happens that Orest is not dead. He shows up and, not enlisted by Elektra, he does the deed. For a long time, all I heard in Elektra was grey noise with shouting. Ozawa’s performances here showed that there could be a long line with very comprehensible harmonic changes. His Karajan training? (Somewhere there’s a pirate fragment of Glenn Gould playing excerpts with much the same result.) Last night’s performance didn’t dial all that progress back, but I do wish it had been a little relaxed in spots, so it could have sung and danced a bit more. Perhaps there was the worry that the performance was still jelling. Nelsons conducted very firmly and crisply right from the beginning, so there could be no doubt where one was. By the time it hits New York, everyone may be more confident and he may be able to let it breathe. On the other hand, I saw him over-conduct the opening of Shostakovich 9 on the Saturday, when everyone should have been in the groove. Anyway, for whatever it was missing, it was still a great night out. The singers were all remarkably good– to the point that Chrysothemis almost stole the show. One weird flaw in the production was Aegisthus’s murder, which I’d have thought would be offstage or at least closer to the stage door. Instead, he stood right in full view complaining about invisible assassins, and then wandered off. What’s not in doubt is that last night what an historically great evening of singing, playing and conducting. An extraordinary evening indeed! I don’t hope ever to hear a better performance of “Elektra.” But Michael Beattie’s “historically great evening of singing, playing and conducting” omits, I think, another of the evening’s great virtues–wonderful acting on everyone’s part, down to the smallest roles. Christine Goerke’s brows and eyes are magnificent messengers of mood and menace (sorry, that alliteration was wholly accidental–lucky I didn’t say “murderous” as well). And Gun-Brit Barkmin’s Chrysothemis was so achingly vulnerable that one might well weep at her predicament and feel prompted personally to comfort her. I have never been so moved by an “Elektra” performance before, and was astounded by the rich voices that were never drowned out by the orchestra. I dreaded in advance being seated in the third row center section of the orchestra, but soon enough I realized that I was really in the courtyard of Agamemnon’s palace. 1366 words of “background” and self-referencing preference, and 401 words of performance review. (Easy to calculate in Word.) It was an extraordinary event, musically and theatrically. The tone of my comment was ungracious. Though I don’t always agree with his criticism, Mr. DeVeto’s scholarship is beyond reproach and I’m grateful that, in BMInt, we have a forum in which there is room for detailed discussion. I still would have enjoyed reading more about the performance. Ah, Elektra! The heartwarming story of a family that, for once, is *not* riven with sibling rivalry! I wish, however, that Hofmannsthal’s libretto were not so purple in so many places; I think sometimes that Strauss rebelled by having his music doing things that were plainly at odds with the words. Unlike Mark, however, I found the music quite coherent; with that Agamemnon theme transmuted so many ways throughout, it gave the sense of a gargantuan tone poem. I would not at all denigrate the review for spending so much time on the opera and its context before commenting on the performance. I think the best-written reviews by Shaw and Thomson did just the same thing. Although I’m generally in agreement with Mark and Alan Levitan, I would quibble when it came to James Rutherford. I thought his singing was fine, but was disappointed by his lack of stagecraft. He just sort of stood there immobile, with neither facial nor bodily motion to give life to Orestes’s guile and violence. I was, however, bowled over by Christine Goerke, Gun-Brit Barkmin and especially Jane Henschel. Has any other opera had such an abundance of great female roles and so few male ones? Gerhard Siegel was wonderful, but his part was tiny. This was a concert and there was no production. This work is not for low-listening-intensity (see great genius RW’s definition) audience, so the standard of criticism should be high. Nelsons once again proved his ability to control this traditionally musically-un-german orchestra and produce very convincing music. There were a few places where the orchestra did not sound focused enough to give adequate company for the words the singers sung. One example I remember very clearly was in Chrysothemis’ first appearance before she went off stage, the music was played awfully weak. But fortunately there were not many moments like that. Gun-Brit Barkmin is a great find (she sung Salome well too). One can only dream there could be a little more sweetness in her voice, which might be too much to ask for. She was very convincing, alarming, freightened, fresh. The great musicians (very very few) would avoid conducting this work because it is emotionally too taxing. The commoners do not want to hear this work often, before they lack the emotional capacity to understand such a work. The title role is extremely demanding. I think the heartbreaking (did someone say heartwarming?) ‘Agamemnon! Agamemnon!’ could be heavier and more painful. To build up the painfulness, Elektra has to be very sharp and above orchestra at the end of mother-daughter scene. my impression was that her voice was not thrilling enough. But it could be due to my poor health condition. Typically I would not prefer an opera in concert. However, with many Euro-trash staging out there, it is not bad to see performance like this. PS: an abundance of great female roles and so few male ones? If one knows Strauss’ music, he ought to know his love for sopranos and female singers. Die Frau is a much more notable example of three highly demanding female roles. Saturday night Barkmin was somewhat less than wonderful, a shade below pitch in the highest register a few times. The conducting was fine and the music danced beautifully except for the rushing commented upon above. The passage in which Chrysothemis describes her desire for a woman’s fate and Elektra great series of seligs were horribly rushed, the first taken at such a clip that Barkmin couldn’t keep up. A good night overall, especially our Elektra. But modified rapture, I’d say, is in order. I hope to see the performance in NYC on Wednesday but did see the curtain calls on YouTube. Good journalism demands that a reviewer report on the the reaction of the audience which, even in an era of highly inflated reactions, was really ecstatic. Also I have never seen as many BSO musicians applauding soloists, and I have been attending BSO concerts since the Munch era. I much enjoyed Prof. Devoto’s astute exegesis and assessment of the opera itself but was surprised that neither he nor any comment-writer thus far expressed an opinion on Christine Goerke’s stunning and, for me, stunningly wrong bright-red dress. There is much from Elektra herself and certainly others concerning how down-at-the-heels she has become since her father’s murder, and any performance billed as “semi-staged” ought to pay that some mind. “Semi-staged” doesn’t necessarily mean “fully (or even partially) costumed. Aegisth and Orest wore tuxedos, Chrysothemis sported a very un-Chrysothemis boa and attractive gown, Clyltemnestra wore a suitably formal gown as well (hardly Mycenean). The overall decision, I suspect, was that good acting and singing would carry the evening so dress as attractively as you like. No one wants to look unattractive in rags unless forced to in a full production. 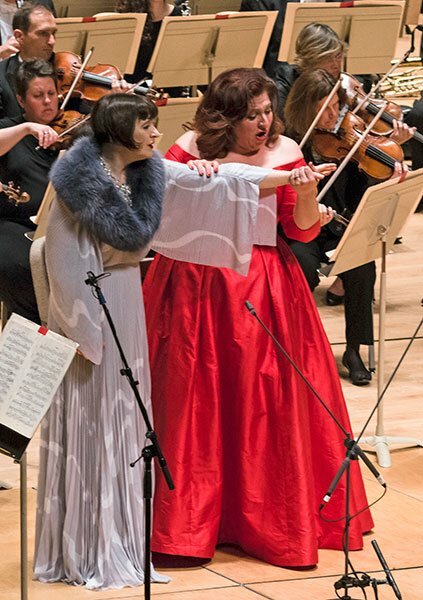 I think Ms. Goerke and Ms. Barkin might have balked at appearing in tatters in a concert version; they must have understood that an audience can use its imagination and a blood-red gown might do very well for a blood-lusting Elektra. A “review” that seems to be all about Mark DeVoto and what he likes and doesn’t like, and spends the first half of his (over-long) piece of reporting downgrading much of the Master’s work!….When the singers are finally mentioned, there seems to be very little space left on the page for their efforts. I’ve always admired Mark DeVoto’s incredible knowledge and astute observations. So I was quite surprised to read “one gets the impression that any dramatic structure in the music itself is mostly unplanned”. I spent some time at Eastman many years ago learning otherwise. Normally I can find material like this online, but I’m afraid the internet has let me down. And I’ve spent the past day or so looking for a confirmation (much less my notes for the class that may or may not reside in the attic) of the solid structure that is Elektra. The late Robert Bailey published relatively little not involving Wagner (the most famous volume is his Norton score to the “Prelude and Transfiguration” (NOT Leibestod, and he explains why in the volume) to Tristan & Isolde. Anyhow, I took his graduate level course in 20th Century musical analysis, and we spent about a week on Elektra. Dr. Bailey made a very convincing case for the solid layout. Without my notes etc. I cannot convey too much, but the structural/harmonic half-way point is the announcement of Orestes death, which on most recordings I’m familiar with, is the start of CD2. Clock time as well, makes each half about 50 minutes each. There’s much more of course, but perhaps someone else could elaborate. The red dress became an issue when Goerke at several points settled in her chair and smoothed her skirt in a very un-Elektra like way. She also fiddled with her hair a lot. This was semi-staged in that the singers went in and out of character willy-nilly. One notes that the program did not assign directing credit. Thus the result was inconsistent and amateurish. On the other hand, whoever managed the entrances and exits did a terrific job, with characters arriving with a minimum of distraction. And to answer the comment above: there was no way to get Aegisthus to an off-stage location for his death. It was the only blocking problem of the night and, I think, forgivable given how well the disposition of forces worked in every other detail. The Wednesday night New York performance was astounding. The ensemble was unforgettable. An Elektra for the ages. BSO truly rocks! Tommasini of the NYTimes couldn’t, in his excitement, refrain from writing a brief pre-review review last night right after the performance, which appeared in this morning’s paper; his full review will appear on Friday. He called the performance “stunning,” “astonishing,” “inspired,” “blazing,” “brilliant.” He also said that “Ms. Goerke now owns this role.” I look forward to his review on Friday. I was also at Carnegie on Wednesday, and though I was waiting–in vain, it turned out–for the fuller review Tommasini promised for today before saying anything, this was certainly a knock-your-socks-off performance. Nelsons’ pacing and control were tighter, almost everything was technically perfect, and the singers and players were at their most committed and persuasive. I was most particularly impressed with the clarity and control in the softer sections. The ovation clocked in at 12 minutes (I’m told it ran to 15 in Boston on Saturday), and audience members filing out were visibly moved, some nearly breathless. Most of the comments on the NYT site reflect this. This comment is in response to Raymond’s commentary regarding the acting, hair fussing, and dress smoothing. I’m sorry that you found those actions to be outside of the characterization for Elektra that you imagined. Elektra says that she was a king’s daughter. Would it truly be something wildly out of the ordinary that she would sit and calmly try to make herself appear as such- especially when she thinks the deed that she’s waited for years to have accomplished is nearly done? She also speaks of her hair and how beautiful it was. Is it a far stretch to assume that she spent a lot of time fussing with it? Just because it wasn’t necessarily a dramatic choice you might have made does not mean it wasn’t thought through. How lovely of you, Christine, to take the time to enter into the dialogue and clarify your interpretation! Personally, I was convinced by your hair gestures — which evoked Elektra’s fragmentation and insoluble ambivalence about her feminine identity, her royal identity, her mother, her father. On the one hand, her hair, and all that it symbolizes in the historic/tragic shift from primitive matriarchy to warrior-patriarchy (ultimately, it was her sacrificed sister Iphigenia’s hair that she was both messing up and smoothing!) and on the other hand, the axe — symbol of her phallic mother, of her mother’s vengeance, savage justice and crime. To me, a single moment of weakness on the opening Thursday night at Symphony Hall was the English subtitles for the “I forgot to give him the axe” scene. While you appropriately interpreted it as a frenzied crux in which Elektra realizes that she is identified with her mother but has also become a castrated version of her mother, the English subtitles connoted “Silly me, I forgot the axe”. I realize that the English subtitles here are faithful to the German: but the phrase in the German is repeated and put forth in a more disturbing way, if you will. In other words, I felt that the English subtitles did you a disservice in that specific but crucial scene. While I’m at it, THANK YOU for a great Elektra! In a way I wish I hadn’t exchanged my subscription ticket to the opening night of Elektra. All the reviews make it clear that this was an Elektra for the ages. While I definitely want to hear Unsuk Chin’s “Mannequin” in its American premiere on November 5, I could have bought a ticket or exchanged a different one. It seems that this performance of Elektra falls into the “not to be missed” class. Nevertheless, the reason I chose to exchange my ticket had nothing to do with the (then unknown) quality of the performance. It was just that I didn’t really want to hear Elektra again. I had seen a video of it on TV many years ago, and I felt that one hearing was enough. There may well be a level of performance that makes it worthwhile to go hear a work one doesn’t like. The degree of one’s dislike is a factor along with the greatness of the performance. Unfortunately, when it comes to the first night, it’s impossible to be sure in advance just how great the performance will be, so the decision is based largely on the work itself. The Karl Bohm posthumous recording? Made me almost ill at that time– I lasted 40 minutes before needing a walk in the spring sunshine. I don’t remember the specifics, but I don’t think it was Böhm. The 1980 Metropolitan Opera revival of Elektra, conducted by James Levine, and sung by Birgit Nilsson, Leonie Rysanek, and Mignon Dunn was aired on PBS. I have to say this much anticipated NYT review is nothing inspiring. It does not smell good when silly claims of supporting new music pretentiously ask to be treated in a serious way. The classification should always be good music and bad music, both composition and performance. Mr. Nelsons has shown he can produce some seriously good performance, which is quite unusual already in this industry, more commercial and far less artistic. ‘new music’? look what damage has been done by ‘Sir Simon’?